Lockly's Secure Plus smart lock brings style, security, and a whole lot of bulk to your front door. Billed (by its manufacturers) as the “World’s most advanced smart lock,” the $250 Lockly Secure Plus offers many of the now mainstream features we expect from a modern deadbolt, such as Bluetooth connectivity, smartphone app control and access codes for friends and family. But there are a couple of standout features that separate this smart lock from also-rans. An integrated fingerprint scanner allows you to conveniently unlock your door should you forget your phone, and for additional security, Lockly’s digital keypad switches the position of access keys each time someone approaches your front door. Of course, today’s smart lock market is packed with choice. They include security stalwarts like Yale (with added intelligence from August) and Schlage to funky upstarts such as Gate, while brands like Kwikset have been producing Bluetooth smart locks for more than fifteen years. So, with high-quality smart locks available at almost half the price of Lockly Secure Plus – easy to install and packed with features – has this deadbolt got what it takes to command such a premium? Available in a choice of Satin Nickel or Venetian Bronze, the lock certainly looks the part, with a reassuring combination of style and heft. 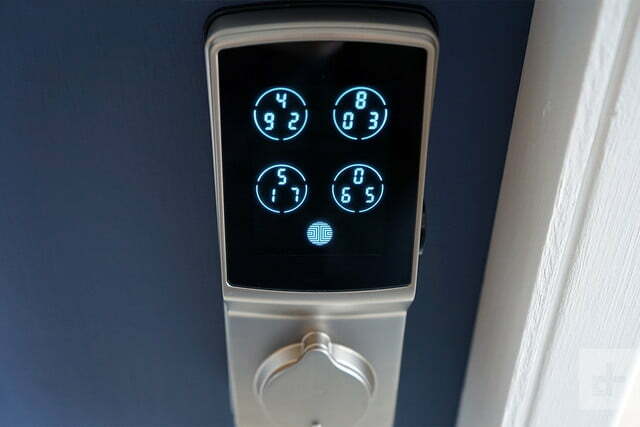 We’re big fans of smart locks that offer access versatility. Along with Bluetooth and smartphone control, Lockly’s large digital touchscreen, fingerprint reader and support for traditional metal keys ensures ease of access for family and friends. The keypad/keyhole combo certainly adds height to the lock (7.05 in. / 179 mm x 2.01 in. / 74 mm), meaning it’s not as dinky as Nest x Yale, Yale Assure SL or Gate’s cute and curvy design, but it’s no eyesore. 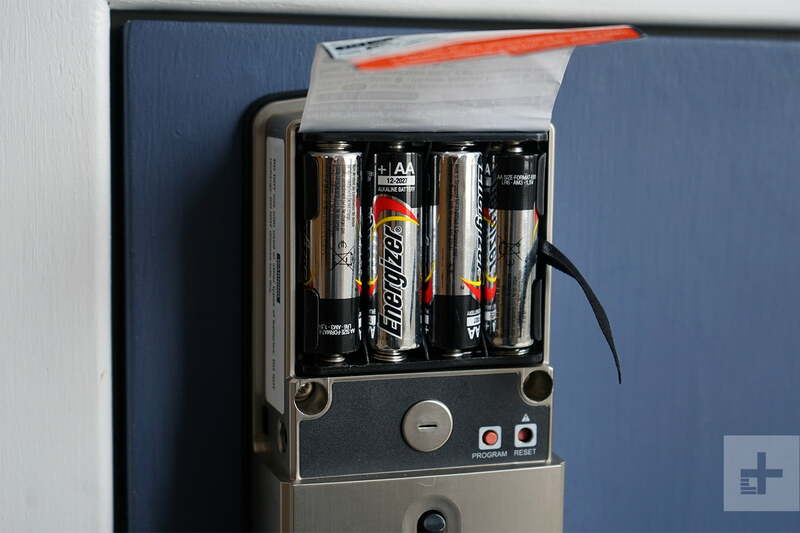 The rear of the lock, housing four AA batteries, is typically boxy like competitors and again, taller than most (7.4 in. / 188 mm x 3.15 in. x 80 mm). Clad in the same metal finish as the front face, it looks large when hung on the door, but at least has a premium finish. An ugly FCC sticker on its base, with a large “Do not remove!” warning, is something we’ve not seen on other locks and detracts somewhat from the design. Available in a choice of finishes, Lockly is crafted with a reassuring combination of style and heft. 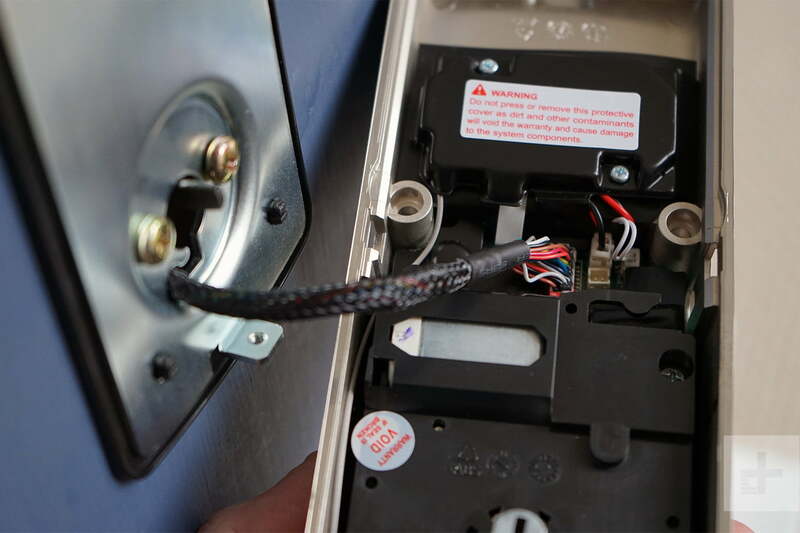 Accompanying the two sides of the lock you’ll find keys, screws, a deadbolt, door strike and a lot of 3M adhesive tape to secure Lockly’s front face during installation. Our review model shipped with an internal mounting pin, designed to stabilize the lock when fitted to your door (requiring additional drilling). The company now advises that the supplied adhesive tape can be used instead, reducing installation difficulty and permanent damage to your door. The size and weight of the lock leads to a slightly trickier installation compared to other locks we’ve tested, but it remains a reasonably straightforward job. 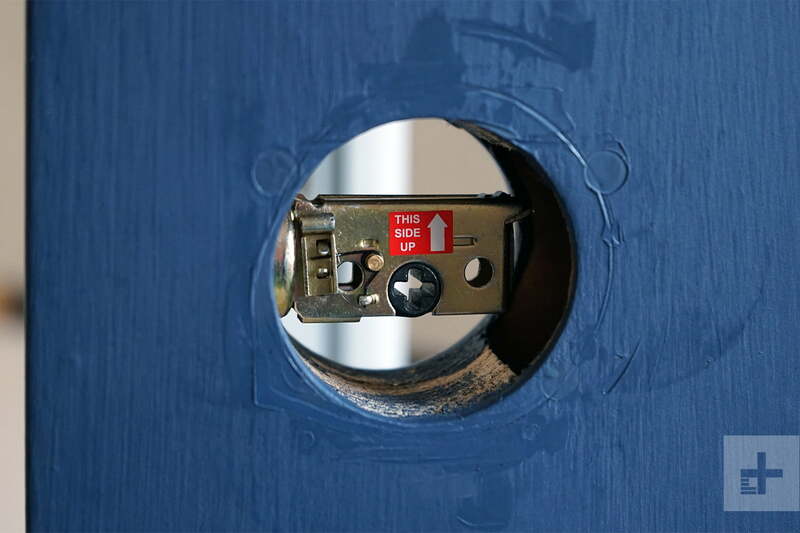 Lockly’s comprehensive (paper) instructions and drill guides are a help, but if you don’t opt for drilling a hole for the top stability pin, you’ll certainly need that 3M tape to hold the front of the lock to your door while you secure the rear mounting screws. That said, the lock’s internals, including the deadbolt, screws and electronics assembly, are well-built and easy to work with, unlike some locks we’ve tested in the past twelve months. 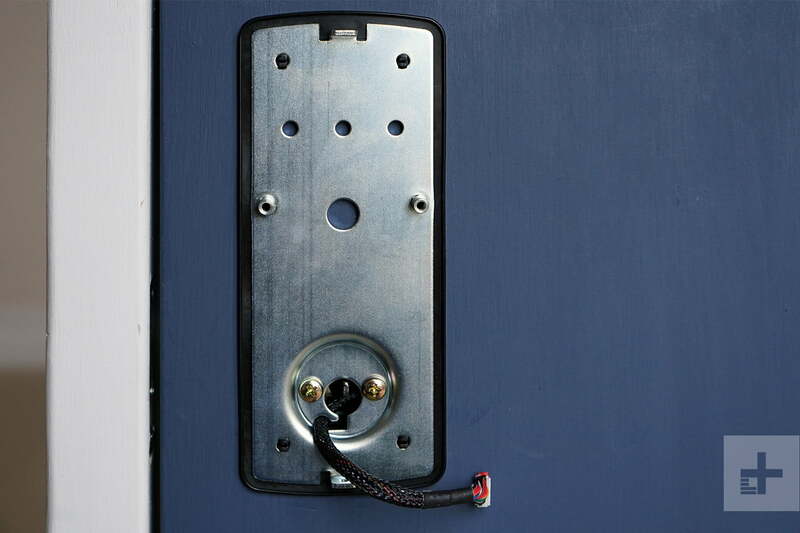 Once you’re through that initial awkwardness, installation should proceed quickly – we replaced an existing deadbolt with Lockly in less than fifteen minutes. Setting up a Lockly account is a serious affair, with individual verification codes sent via SMS text message and then email before you proceed to configure a password. It’s a little extra work, but a strong signal that it’s not just the lock that’s secure. You’re not done yet! Each lock ships with an individual activation code, printed on a wallet-friendly card in Lockly’s Quick Start Guide. You’ll need this code to pair your phone with the lock over Bluetooth, and once that’s entered, you’ll then set another admin code. 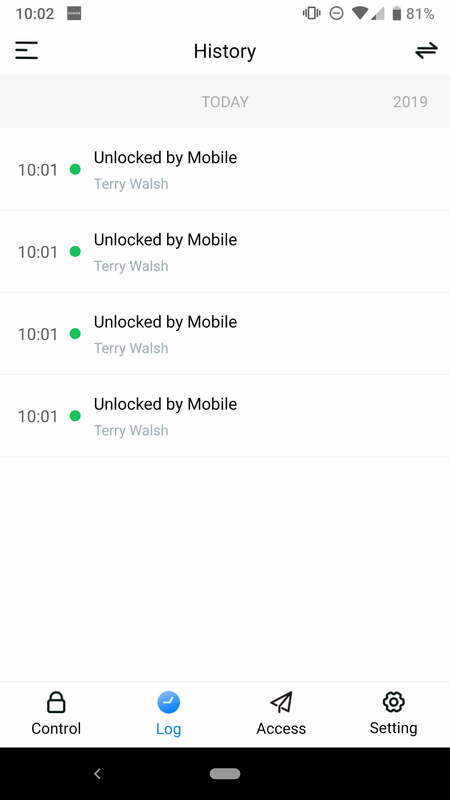 It’s one of the most comprehensive account security protocols we’ve encountered on a smart lock. Setting up a Lockly account is a serious affair, with individual verification codes sent via SMS text message and then email before you proceed to configure a password. The Lockly app is easy to use with the now-traditional large round button toggling the deadbolt. 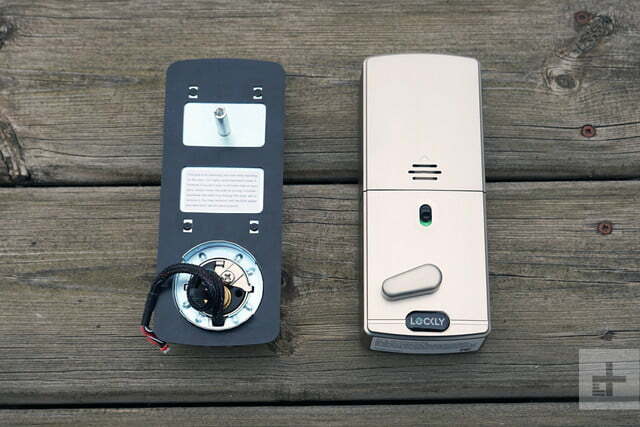 We found Bluetooth connectivity to be stable and responsive, with the deadbolt activating within a couple of seconds from cold. We did however encounter repeated calibration issues during our tests, with the lock status incorrectly reported as locked when it was in fact unlocked, and vice versa. Repeated attempts to automatically recalibrate the lock did not resolve the issue, which was a concern. One aspect of Lockly that we loved was the versatility and ease with which access could be made available to family and friends. Regular users can be configured in the app with a 6-8 digit PIN access code sent to them via email. 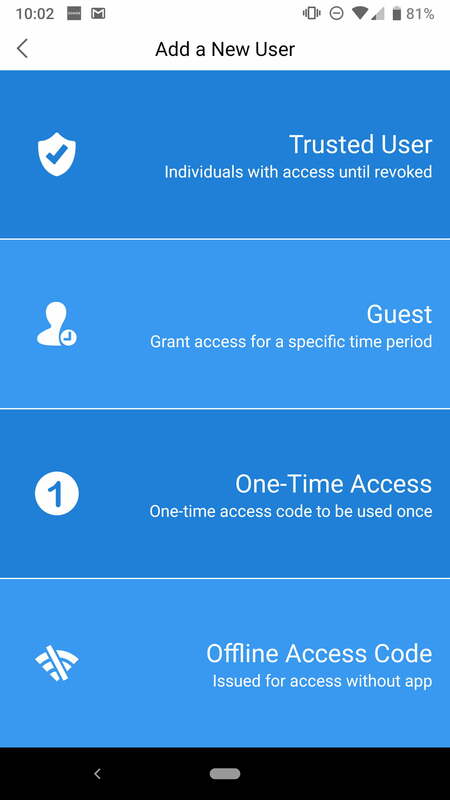 This access code allows them to download and configure the Lockly app on their own phones for use with the lock. 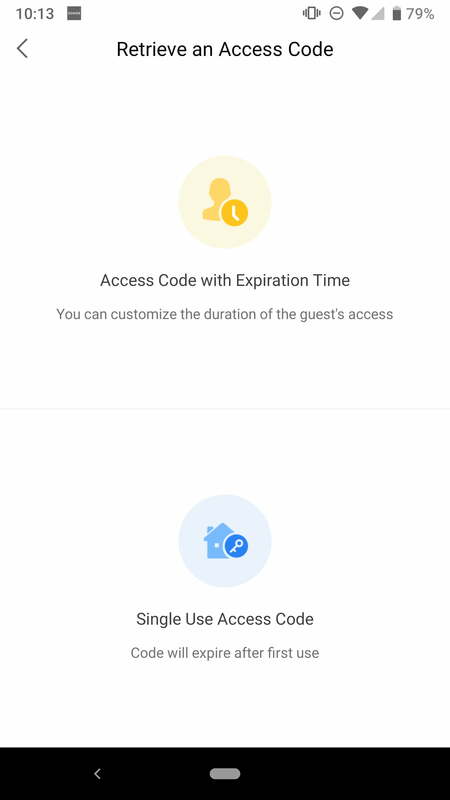 Alternatively, time-limited eKeys and one-time access codes and offline numeric codes (to be used with the digital keypad) can be issued to guests. Whether you need to provide regular access to the house cleaner, one-day access to the babysitter, or an emergency code for the next-door neighbor, you’re covered. Should you need remote access to the lock, an $80 Wi-Fi hub is on the way next month. Repeated calibration issues led to lock status being incorrectly reported. 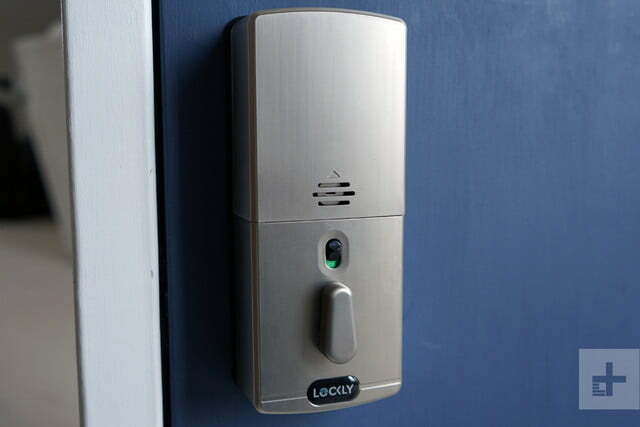 Biometric access is a feature not commonly found on many smart locks, but Lockly’s side-mounted reader works very well. Fingerprint registration, using a combination of the smartphone app and the lock’s reader, takes a minute or two to set up, with five successful scans required for completion. From there, simply place a finger on the reader and you’re in. No need to remember your keys or your phone, and if you’re worried what will happen should the lock lose power, a 9V battery placed on pins at the bottom of the lock provides an emergency boost. 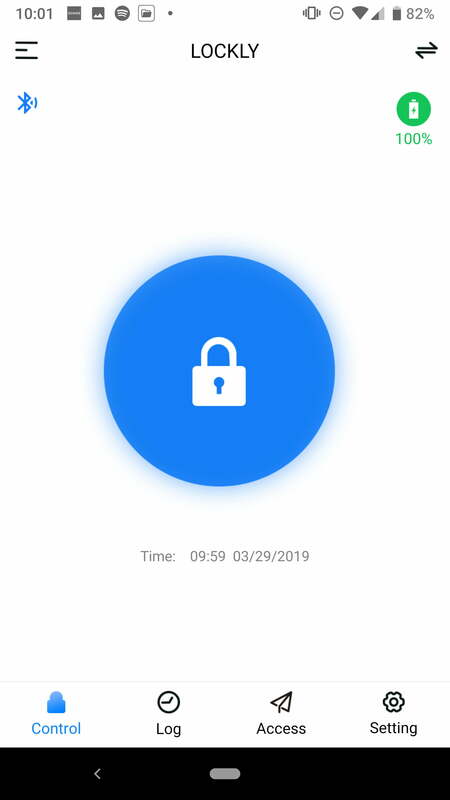 Elsewhere, Lockly delivers secure peace of mind through now common features like user configurable auto-locking (up to 300 seconds), a detailed log of user access and, of course, randomized display of pin numbers on the lock’s screen. This novel feature ensures that anyone spying on you when you enter your access code can’t guess the code by noting the areas of the screen you press. An insight perhaps lifted from Hollywood rather than a serious issue in your local neighborhood, but one that works well. 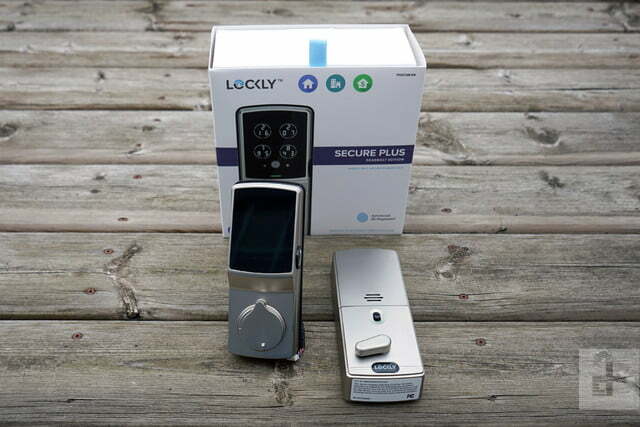 Lockly Secure Plus boasts a lifetime warranty on exterior finishes and two-year’s protection on electronic components. It’s one of the best warranties available in the smart lock market today. Overall, Lockly Secure Plus is a worthwhile contender in the smart lock market, although a number of issues prevent it from receiving our full recommendation. While we love its versatility and ease of use, it’s larger and heavier than most of its peers which leads to a trickier installation. While Lockly’s designers have done a great job is crafting a stylish and secure device, it’s sheer bulk means that it’s more obtrusive than many competitors. The calibration issues we experienced were a drawback, and while this can be a common issue when installing smart locks, we were surprised to find that we were unable to resolve the issue despite several attempts to reset the lock. As such, we can only give Lockly Secure Plus a guarded recommendation. While it lacks all of the access features of Lockly Secure Plus, if you’re simply looking for a great-value smart lock to use with your phone, at $149, the August Smart Lock is a great value pick. From a hardware perspective, a lifetime warranty and a robust build should ensure a long life for Lockly Secure Plus. The calibration issues we encountered and the manufacturer’s relatively new entry into the market tempers our excitement, but two year’s protection on electronics should provide some reassurance. At $250, despite its versatility and some novel features, Lockly Secure Plus is a pricey proposition compared to some peers. If you need a lock packed with access features, it offers style, value and security, but there are cheaper locks that fit the bill for many homes.